This paper analyzes the ongoing drug war being waged between Mexican drug trafficking organizations (DTOs), their rivals, and the U.S./Mexican governments. This analysis is conducted through the lens of drug control; namely, through an examination of the distinct strategies of interdiction and international operations. While both of these strategies carry inherent risks and benefits, the analysis conducted herein indicates that the realm of international operations holds greater potential to directly affect the dynamic environment in which these DTOs thrive. As such, specific international operations that are likely to succeed are explicated, while those that have the potential to backfire are highlighted as a cautionary case study. This paper concludes by suggesting a tripartite international operations strategy that entails financial strikes against DTOs, the provision of foreign aid to the Mexican government, and the revitalization of its civil institutions. This paper analyzes two different strategies that are designed to deny, degrade, or disrupt the flow of illegal narcotics from Mexico into the United States. These strategies are interdiction (securing a border and its ports of entry so as to seize drugs upon ingress) and international operations (the provision of aid to a foreign country, coupled with transnational operations that target criminal groups therein). 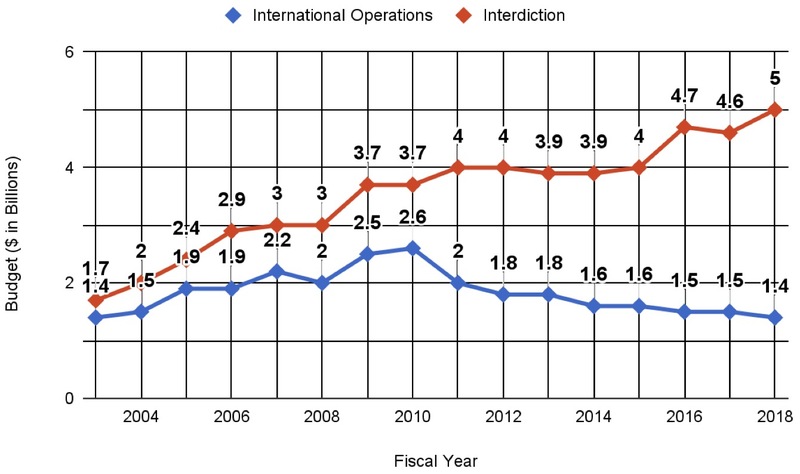 In recent years, the funding of international operations has plummeted while interdiction funding has continued to rise (see Fig. 1). Figure 1. U.S. Federal Budget For Interdiction and International Operations - Fiscal Years 2003-2018 (Request). Author’s graph based on data from Executive Office of the President of the United States, 2017, 2014. By defunding international operations, the U.S. government weakens its own capacity to dramatically affect the criminal organizations that have gained power throughout Mexico. This is especially troubling due to the fact that international operations are able to target the root of the criminal issues in Mexico - as opposed to interdiction, which does not strive to radically affect Mexican DTOs but merely seeks to keep their primary product out of the U.S.
As such, this paper will seek to establish two assertions: (1) that, given the Sisyphean nature of interdiction and the capacity of international operations to disrupt criminal networks, international operations should be given the preponderance of drug control funding; and (2) that effective international operations must incorporate a wide range of techniques, including, but not limited to, the revitalization of civil institutions in Mexico. Before drug control strategies can be discussed, it is necessary to first examine that which they seek to control. It is not merely the flow of drugs into the U.S. that is targeted by these strategies, but the criminal organizations that destabilize entire nations in order to create an environment that they can traffick narcotics in. In this respect, Mexico stands out due to the immense power that these organizations wield - creating a conflict between them, their rivals, and the Mexican government that has produced crimes against humanity the likes of which are rarely observed outside of warzones. Such is the level of violence generated by this conflict that an estimated 200,000 homicides have occurred in Mexico since 2006 (Agren, 2017). This violence continues to intensify, with 2017 “set to be the country’s bloodiest [year] since the government started releasing crime figures in 1997, with about 27,000 murders in the past 12 months” (Agren, 2017, para. 6). Reliable data on this matter is extremely difficult to obtain, largely because Mexican drug trafficking organizations (DTOs) - commonly referred to as “cartels” - have become the new mouthpiece of public information in the territory that they control. This has been accomplished in a two-step process. First, cartel enforcers terrorize journalists by means of targeted killings and bombings of newspaper headquarters and TV news stations (Hanen, 2016). These actions have led Reporters Without Borders, a non-profit organization that tracks violence against journalists, to designate Mexico as the deadliest state for reporters in the Western Hemisphere (Hanen, 2016). After they have sufficiently terrorized and coerced journalists into silence, Mexican DTOs assume their duties by controlling the dissemination of public information through the use of narcomantas - crude banners that claim responsibility for killings or instruct citizens when they can and cannot leave their homes (Deibert, 2015; Grayson, 2010). The fourth estate is not the only institution that has been plagued by cartel interference. Indeed, law enforcement throughout Mexico has also been corrupted by the classic criminal philosophy of plata o plomo (silver or lead) - an expression that offers its recipient the choice between money taken as a bribe or lead from a fatal rain of bullets. While the true extent of this corruption is difficult to measure - a recurring theme in the study of organized crime in Mexico - it is clear that police who do not obey cartel commands are subject to extreme violence perpetrated upon themselves and their families. As a testament to the severity of this violence, the residents of Palomas, a city in Northern Mexico, were forced to fend for themselves after all of the local police deserted (Bowden, 2011), likely due to the dangers that they faced if they remained. This Kafkaesque environment provides fertile soil in which Mexican DTOs can flourish, trafficking narcotics over the border and into the lucrative U.S. drug market. To combat this issue, federal law enforcement in the U.S. employs the aforementioned strategies of interdiction and international operations; this paper will examine each in detail hereafter. As mentioned previously, the study of organized crime in Mexico is anything but an exact science, with complete and accurate conceptualizations of the issues difficult to ascertain. As such, this analysis will seek to gauge the efficacy of both interdiction and international operations despite the fact that it is impossible to truly determine the quantity of narcotics that escape interdiction efforts or the damage that international operations inflict upon DTOs. In the context of border security, interdiction refers to the act of seizing, denying, or otherwise preventing an illicit substance or entity from crossing into the U.S. This is accomplished through a variety of methodologies, including border fences, strategically-placed checkpoints, X-ray scanners, detection dogs, and physical inspections. A cursory examination of these methodologies seems to indicate success; indeed, Customs and Border Protection (CBP), the primary agency in charge of interdiction in the U.S., seized an average of 7,910 pounds of narcotics per day in the 2016 fiscal year (U.S. Customs and Border Protection, 2017). While this number seems to be quite high, it is clear that drugs are still making their way over the border - the only uncertainty is in regards to the quantity. While domestic and international organizations such as the United Nations Office on Drugs and Crime attempt to pinpoint the exact quantity of narcotics produced in relation to the quantity seized, Saviano (2016) points out that these figures are replete with errors and ultimately leave some 400 tons of cocaine alone unaccounted for. While still prone to misleading representations, a more apt understanding of the magnitude of Mexican drug trafficking in the U.S. can be gained from an examination of the Drug Enforcement Administration’s 2017 National Drug Threat Assessment. In addition to its designation of Mexican DTOs as “the greatest criminal drug threat to the United States” (Drug Enforcement Administration [DEA], 2017, “Executive Summary”), this report details the rise in drug poisoning deaths inside of the U.S. These drug poisoning deaths have reached epidemic proportions, with a record-breaking 52,404 individuals dying from drug poisoning in 2015 (the most recent available data); more than suicide, homicide, firearms, or motor vehicle crashes (DEA, 2017). While it would be fallacious to assume that more drugs are being smuggled into the United States than in previous years, this data does elucidate the fact that the availability of drugs is not significantly impacted by U.S. interdiction efforts. Notwithstanding their efficiency, interdiction methodologies suffer from their Sisyphean nature. Indeed, the task of interdiction can be likened to the tale of Sisyphus, who was condemned to roll a mighty boulder up a hill every day only to have it roll back down once he reached the top. Similarly, as soon as interdiction blocks one drug smuggling technique, the smugglers demonstrate their ingenuity by adapting their methods - thereby causing the metaphorical “boulder” of interdiction to roll back down the hill and leaving law enforcement to begin their task once more. Because of the constant adaptation of their methods, Mexican DTOs now employ an incredibly wide range of techniques to smuggle narcotics into the U.S. These techniques can generally be separated into four categories: the quotidian, such as the concealment of narcotics in food or in body cavities; the sophisticated, such as the use of submarines or tunnels underneath the U.S.-Mexico border; the exotic, such as the placement of drugs in time-released buoys equipped with GPS devices or the combination of cocaine with plastic resin so that it may be chemically extracted upon reaching its destination; and the outlandish, such as the use of carrier pigeons to fly narcotics over the border (Campbell, 2009). In addition to their likely inefficiency and Sisyphean nature, U.S. interdiction methodologies suffer the fatal flaw of relying upon poorly-paid patrol officers and technicians who, while not as corruptible as their Mexican counterparts, have repeatedly been caught committing acts of graft, often by accepting bribes from cartel associates (Flores, 2017). Further sources corroborate the prevalence of this graft, with Turbiville (2011) noting some 576 alleged cases of corruption among CBP employees between 2003 and 2010 that culminated in 129 arrests. Some agents in particular have been accused of especially heinous acts of betrayal through the abettal of organized crime. An example of this can be found in the case of Margarita Crispin, a CBP officer who facilitated the smuggling of multi-ton shipments of drugs (Bowden 2011); another can be found in the case of an unnamed U.S. Border Patrol agent who was recently indicted for a cartel-related murder (Flores, 2017). Border corruption can also be observed outside of federal law enforcement, with the mayor and police chief of Columbus, New Mexico finding themselves under indictment in 2011 for purchasing Kalashnikov-style rifles to sell to Mexican DTOs (Kuhn & Bunker, 2011). While it is certainly possible to mitigate corrupt government practices and individuals, the inadequacy of interdiction methodologies becomes patently obvious when one considers this factor in conjunction with the other issues that are outlined above. According to the U.S. government, international operations are designed to “support the efforts of the United States Government and [its] international partners around the globe to meet the challenges of illicit trafficking of all drugs, including synthetics and precursors, and illicit substance use” (Executive Office of the President of the United States [EOP], 2017, “International”). While this statement aptly describes the overarching mission of international operations, its nebulosity does not provide a clear idea of what steps are taken to achieve these goals. However, an examination of the various areas to which its funding - some $1.4 billion requested for the 2018 fiscal year - is allocated allows one to gain a better understanding of the specific practices utilized by international operations. These practices revolve around two particular types of international operations: foreign aid provision, and DTO disruption. As the first, and likely the most promising, of these types, foreign aid entails the provision of financial, material, and advisory support to a foreign country. In the realm of international operations, foreign aid is governed primarily by the U.S. Agency for International Development (USAID), which provides funding for the U.S.-Mexican foreign aid program known as the Mérida Initiative (described below). The second typology that constitutes international operations, defined here as DTO disruption, employs traditional law enforcement techniques such as targeted strikes, surveillance, and investigations to weaken DTOs and incapacitate their leadership. These efforts are led by the DEA and the U.S. Department of Defense, which were allocated $470.4 million and $491.1 million respectively for the 2018 fiscal year (EOP, 2017). Although both types of international operations have great potential to reinforce civil institutions and disrupt drug traffickers in Mexico, their use is associated with certain dangers; these will be discussed in detail in the following section. Because of this new leadership structure, traditional decapitation strikes are no longer able to decimate DTOs; in fact, such strikes often splinter a large organization into numerous smaller cells that act independently of one another (Deibert, 2015). As such, according to Mexico’s Minister of the Interior, the criminal panorama of that country has actually become more perilous - with the former Mexican Attorney General claiming that “up to eighty small- and medium-size cartels [are operating therein]” (as cited in Deibert, 2015, p. 230). While kill/capture operations are essential to the success of international operations, the provision of foreign aid is also an integral part of the process. However, here too there are inherent dangers. These dangers arise in regards to the specific allocation of foreign aid funds, which, if inappropriately distributed, can generate further violence and instability in a region. Indeed, given the aforementioned corruption that pervades Mexican police forces, it may be tempting to provide foreign aid to small groups of paramilitary fighters instead of official Mexican military and law enforcement agencies. Historically, the U.S. has employed a similar strategy throughout the Middle East; a recent example can be found in the provision of support to Pashtun fighters in their conflict against the Taliban during the initial stages of the U.S. War in Afghanistan (see generally Grenier, 2016). Regardless of the efficacy of this strategy in past conflicts, the funding of nongovernmental paramilitary organizations in Mexico will assuredly bring about negative results as those same organizations shift into patterns of criminality when they realize that there is a lucrative market that can be filled in the cartel’s absence. An aperçu that exemplifies this shift into criminality can be found in the case of the Autodefensas (literally, “self-defense forces”), a loose grouping of paramilitary cells that assembled to oppose cartel violence in the Mexican state of Michoacán. Despite their success in combating the quasi-religious La Familia cartel and its successor, Los Caballeros Templarios, the Autodefensas soon began to contribute to the same social issues that they sought to defeat. In fact, according to Guerra Manzo (2015), the Autodefensas developed “mafia [associations] that encourage more cycles of violence” (p. 7). Furthermore, analysts indicate that at least one cell of the Autodefensas has moved to fill the void in the local narcotics market by metamorphosing into a DTO in its own right (Bargent, 2014; Corcoran, 2017). As such, the funding of any nongovernmental paramilitary force in Mexico is prone to backfire due to the potential for those forces to seize the helm of criminal enterprise in the region - thereby running directly antithetical to U.S. interests. Despite the hazards that arise as a result of the improper application of international operations, their use can produce quantifiable benefits if sedulously implemented. Perhaps the foremost example of this can be found by examining Plan Colombia and its eponymous country. Although he ultimately rejects the comparison, Grillo (2011) states that “Colombia’s experience of cocaine-funded guerrillas and paramilitaries is certainly worth learning from. In all the world, Colombia is the country that has faced a criminal insurgency most similar to Mexico’s” (p. 209). While they are ultimately two different nations with two different sets of problems, Mexico and Colombia both know the violence that can arise from well-funded and heavily-armed DTOs. In the latter’s case, the U.S. stepped forward with a robust international operation known as Plan Colombia. This operation provided aid to Colombia, leading it to justly be “credited with helping revitalize the Latin American country” (Toosi, 2016, para. 3). The results of this revitalization are visible from an examination of Colombian homicide rates in 2016, which reached their lowest point since 1974 with a rate of 24.4 homicides per 100,000 individuals (Carlos Villegas, 2016). However, this about-face in Colombian homicide rates did not come cheaply. According to Toosi (2016), the U.S. has spent almost $10 billion on Plan Colombia from 2000-2016 - far more than has been spent or even envisioned as part of the U.S.-Mexican foreign aid program (described below). Ultimately, international operations are more effective than interdiction because the former is designed to target the root of the problem (i.e. social ills that contribute to criminality and the criminal organizations themselves) while the latter is used to merely combat one of its many symptoms (i.e. drug trafficking). Indeed, by their very nature, international operations take the fight to the enemy in Mexico by disrupting their leadership structures and interfering with their control of government institutions. In contrast, interdiction has very little capacity to seriously affect DTOs and their means of profit acquisition as the seizure of their narcotics is a contingency that these organizations plan for and expect. Despite its benefits, the potential dangers that are associated with international operations (described above) require that they be assiduously applied. Therefore, the next section of this paper will propose a tripartite plan of international operations that will remain conscientious of these dangers in order to avoid them. This proposal will be arranged into three separate modules which, if enacted in succession and with due diligence, are designed to decimate Mexican DTOs before replacing their obscene system of pseudo-governance with a state-run alternative. As such, these modules will enjoin the U.S. to: (1) decimate the cartels (viz. financially), (2) provide the Mexican state with the necessary tools and funds to occupy the social void left by DTOs, and (3) ensure that these tools are properly used. The purpose of financial strikes is to decimate the cartels in a manner that is not achievable by traditional decapitation strikes. These strikes are designed to be used in conjunction with military attacks on cartel leadership structures. While military attacks are an essential aspect of targeted operations, they cannot seriously affect Mexican DTOs due to the fact that these organizations will still retain control of vast financial resources. Indeed, as mentioned previously, military action is liable to to merely disseminate the threat of DTOs throughout Latin America in the form of smaller cartel cells. In order to avoid this, it is requisite to financially devastate these cartels before striking out at their leadership structures. If their finances and assets are decimated, the remaining lieutenants and enforcers - who would normally fall into internecine conflict in the absence of an established leader - will be left without the resources necessary to recoup the cartel to its former strength. While the concept of financial strikes is a promising one, it is assuredly not a unique one as noted academics such as Grayson (2010) have suggested similar tactics long before the inception of this paper. However, as of this time U.S. law enforcement continues to encounter numerous obstacles involved in the seizure of cartel assets. As such, Hanen (2016) has made the astute observation that the application of the Foreign Terrorist Organization (FTO) designation to Mexican DTOs will enable the U.S. to “carry out economic sanctions against [them]...[and to require] all U.S. banks and financial institutions to retain control over any funds that belong to an FTO that are found to be in the bank’s possession” (p. 190). Furthermore, labeling Mexican DTOs as terrorists will cement their importance into the American consciousness as the label has adopted an elevated level of importance after the attacks on September 11, 2001. Therefore, the U.S. Department of State should take action to immediately label Mexican DTOs as FTOs in order to enable U.S. law enforcement to strike out at their financial systems with the full support of the American populace. While well-intentioned, the Mérida Initiative suffers from two fatal flaws: (1) its current level of funding will not be able to achieve these ambitious goals, and (2) it has been far too cavalier in its appropriation of resources in Mexico. To address the first issue, one must examine the funding of Plan Colombia: some $10 billion in sixteen years (Toosi, 2016). In comparison, the Mérida Initiative has only been allotted $2.8 billion in nine years - of which only $1.6 billion has been delivered thus far (Seelke & Finklea, 2017). In order to achieve its goals, the Mérida Initiative will need to receive funding which, at the very least, reaches a level comparable to that of Plan Colombia. The second issue that the Mérida Initiative faces arises as a result of its appropriation of funding. Specifically, this issue can be attributed to the fact that a major component of the Mérida Initiative is its provision of law enforcement equipment and training, which includes “five Bell helicopters, several X-ray inspection devices, law enforcement canines and training for their handlers, and training for over 4,000 police officers” (as cited in Tekin, 2015, p. 3). Because of the aforementioned corruption that is near-ubiquitous in Mexican law enforcement, it is extremely dangerous for the U.S. to provide tactical training to these officers. Historically, counternarcotics forces in Mexico have shown a penchant to defect to the cartels - as evidenced by the rise of Los Zetas, a paramilitary DTO whose leadership was initially comprised of former Grupo Aeromóvil de Fuerzas Especiales (GAFE) soldiers (Grillo, 2011). Before many of its members deserted to Los Zetas, the GAFE was a potent counternarcotics force in the Mexican military; some have even attributed their potency to U.S. training (Grillo, 2011; Vulliamy, 2010), although such findings would carry grave implications. Regardless of the veracity of these charges, the U.S. must be extremely wary when providing any form of training to Mexican law enforcement or military in order to ensure that it not eventually used against state interests. To avoid this issue, Mérida Initiative funding would be better served in an attempt to reform Mexico’s ethically moribund local police forces before providing them with training and equipment; these aspects will be addressed in detail in the following section. While the Mérida Initiative is certainly a step in the right direction for U.S. drug control policy, its focus is misdirected. In its current form the Mérida Initiative seeks only to provide the requisite tools (i.e., equipment and training) to combat the threat posed by DTOs without carefully examining how these tools will be applied. Therefore, the process of institutional revitalization is necessary to ensure that the Mexican state and its law enforcement agencies do not abuse or misappropriate these tools. Such abuse is a strong possibility due to the prevalent corruption of Mexico’s law enforcement institutions, which has been detailed previously but can never be overstated. While it does not provide a complete picture of its true extent, small anecdotes and facts help one to conceptualize corruption in Mexico. An example can be found in one instance where a seized jet airplane, loaded with cocaine, disappeared from police lockup in Mexico and the cocaine reappeared on the streets of Los Angeles (Bowden, 2011). Another can be found in the fact that cartels spend an estimated $1 billion per year bribing municipal police in Mexico (Hanen, 2016). Because of this corruption, foreign aid programs such as the Mérida Initiative should focus on providing Mexican law enforcement institutions with means to mitigate its corruption before beginning to supply equipment and training to strengthen them. Battling corruption in municipal police forces throughout Mexico will not be an easy task; the U.S. itself faces similar - albeit far less severe - issues of corruption in its interdiction forces (detailed above). Despite this, the mitigation of corruption in Mexico can be achieved through the use of tried and true methods that have been employed in the U.S. with positive results. For instance, early warning systems, which monitor officers in order to distinguish those who abuse their authority from those who act in the interests of justice (Pollock, 2017), could be funded and implemented by foreign aid programs. Another viable possibility comes in the form of civilian review boards, which function as “an independent civilian agency [that] audits complaints and investigations. The board may also respond to appeals and act in an advisory role in investigations” (Pollock, 2017, pp. 216-217). However, due to the lethal reach of the cartels, it would be necessary for these boards to act anonymously in order to avoid reprisals perpetrated upon its members. Perhaps the most promising measure that can be used to reduce corruption in Mexico’s police forces is the use of body cameras. Indeed, by monitoring and punishing officers who are filmed abusing their authority, other officers will become disinclined to commit similar offenses. This can be further amplified by charging the aforementioned civilian review boards with the examination of footage from these cameras - thus eliminating accusations of impropriety on the part of police entities if they were to review the footage and decline to press charges. Body cameras have already spread to Mexico, having recently been adopted by the Tijuana police force (Jones, 2016). While it is still too early to gauge the efficacy of these cameras, their use will likely achieve positive results both in combating police corruption in Tijuana and in strengthening public trust in Mexican law enforcement. Through an examination of both interdiction and international operations, this paper has sought to show that the latter presents a far more efficient and advantageous strategy to combat drug trafficking from Mexico into the United States. Because of the resources and technology available to modern DTOs, interdiction simply does not carry the potential to dramatically affect the mercurial landscape in which these organizations operate. It is bedeviled by its questionable efficiency, its Sisyphean nature, and its penetrability by wealthy DTOs that can bribe officers to look the other way. In contrast, international operations have the ability to directly target DTOs and the social ills that provide fertile ground for them to take root. This ability is not merely theoretical as international operations such as Plan Colombia have made quantifiable advancements in the past. This is not to say that interdiction holds no place in modern drug control policy; indeed, interdiction serves to further starve Mexican DTOs of their illicit profits. Instead, this paper has sought to prove that interdiction alone will not seriously affect cartels to the same extent as international operations. Therefore, the continued defunding of international operations must cease and they must be allowed to do what interdiction cannot: bring the fight to the enemy. However, it is essential to understand that international operations are also associated with inherent risks. In fact, improper use of international operations can splinter cartels into numerous, ultra-violent cells or even generate new criminal groups that rise to fill the void left by the organizations that they fought and defeated with U.S. aid. Because of these dangers, this paper has also detailed a tripartite plan that will avoid these dangers in order to produce positive results in the fight against Mexican DTOs. To do this, drug cartels must first be targeted by the U.S. with precise strikes on their assets - a tactic that requires the U.S. to label them as FTOs. Next, the U.S. must provide further funding to foreign aid programs such as the Mérida Initiative in order to meet the ambitious goals that they set. Finally, these foreign aid programs must be altered to help revitalize Mexico’s law enforcement institutions, which are crumbling under the incessant assault of cartel threats and bribes. This law enforcement support will likely come in a variety of forms, including early warning systems, civilian review boards, and the widespread use of body cameras. In the study of drug control, it is essential to bear in mind that there is no panacea to the problem. While Mexican DTOs can be fought and even defunded through drug legalization, their criminal portfolio is ever-expanding and will not cease its enlargement simply by removing one source of profit. Similarly, neither interdiction nor international operations will wipe these criminals from the face of the Earth. Instead, international operations serve as a glimmer of hope that can break through the blanket of corruption and criminal impunity that currently encapsulates Mexico. Bowden, C. (2011). Murder city: Ciudad Juárez and the global economy’s new killing fields. New York, NY: Nation Books. Campbell, H. (2009). Drug war zone: Frontline dispatches from the streets of El Paso and Juárez. Austin, TX: University of Texas Press. Deibert, M. (2015). In the shadow of saint death: The Gulf Cartel and the price of America’s drug war in Mexico. Lanham, MD: Rowman & Littlefield. Grayson, G.W. (2010). Mexico: Narco-violence and a failed state? New Brunswick, NJ: Transaction Publishers. Grenier, R.L. (2016). 88 days to Kandahar: A CIA diary. New York, NY: Simon & Schuster, Inc.
Grillo, I. (2011). El Narco: Inside Mexico’s criminal insurgency. New York, NY: Bloomsbury Press. Jones, N.P. (2016). Mexico’s illicit drug networks and the state reaction. Washington, DC: Georgetown University Press. Pollock, J.M. (2017). Ethical dilemmas and decisions in criminal justice. Boston, MA: Cengage Learning. Saviano, R. (2016). ZeroZeroZero. New York, NY: Penguin Books. Vulliamy, E. (2010). Amexica: War along the borderline. New York, NY: Farrar, Straus, and Giroux. Benjamin J. Mackey is currently pursuing a Bachelors degree in Criminology, Law, and Society at George Mason University in Fairfax, VA.